Ideal for watering small, medium and large areas. Each pattern can be selected by the simple twist of the selector dial. Offers an adjustable circle of coverage up to 360 degrees with maximum spray coverage of up to 40 feet in diameter. Mounted to a die cast metal sled base, which can easily be pulled through the lawn. The gear drive sprinkler is a great mobile, flexible sprinkler for a variety of watering applications. The pass-through feature allows additional sprinklers to be connected to cover larger areas. 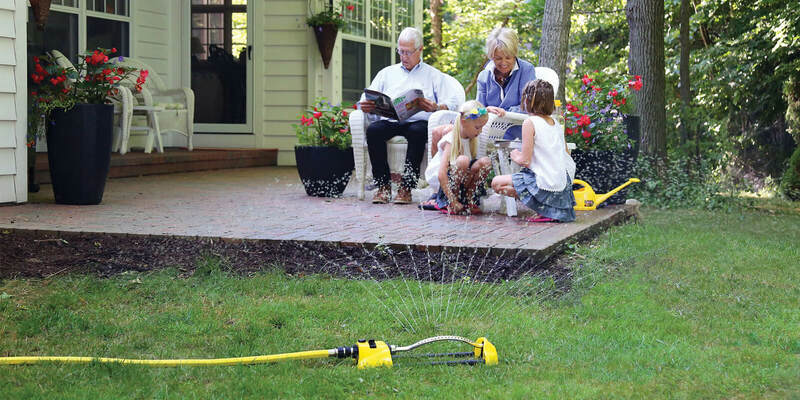 The Color Storm 4-Pattern Gear Drive Sprinkler is made of heavy-duty material and is available in 6 eye-catching colors that won’t get lost in the lawn: red, orange, yellow, green, blue and berry. Ideal for watering small medium and large areas. Each pattern can be selected by the simple twist of the selector dial.